Hundreds of Ryanair flights have been cancelled today as a result of a 24-hour walk-out by pilots in Ireland, Germany, Sweden, Belgium and the Netherlands in a dispute over pay and conditions. The airline said it would be scrapping some 400 out of 2,400 European flights scheduled for today as pilots in five countries walked off the job. Ryanair has criticised the strikes as "unnecessary" but pilots counter that the carrier has refused to engage in meaningful dialogue about collective labour agreements since it began recognising unions in December 2017. Mediation talks between the airline and Irish-based pilots will begin on Monday. Pilots' union Fórsa said the talks will take place at Dublin Airport under the chairmanship of the former head of the Workplace Relations Commission, Kieran Mulvey. Alan Brady is one of those whose travel plans were disrupted. He says he and his family were due to travel on an evening flight from Dublin to Liverpool but it was cancelled due to the strike. After being informed of this last week, he said he went online himself and booked another flight for the same day. However, now he and his family were travelling on an early morning flight at 7am. So it was an early start for him and his family; they left their home in the south of the country after 1am this morning to travel to the airport in Dublin. Germany is the worst hit by today's industrial action, with 250 flight cancellations at ten airports. The country's powerful Cockpit union said it had called on Ryanair's roughly 480 Germany-based pilots to walk out from 3.01am (2.01am Irish time) until 2.59am (1.59am Irish time) tomorrow morning. It accused Ryanair of "categorically" ruling out higher personnel costs for cockpit crew, leaving no room for a compromise. "Ryanair alone is responsible for the escalation we are now seeing," Cockpit president Martin Locher said earlier this week. But the Haarlem District Court yesterday ruled against the airline. "The strike may go ahead," judge Theo Roell said. 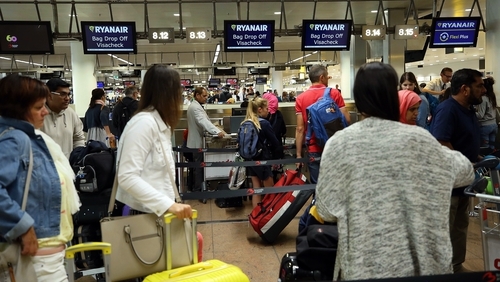 In a statement Ryanair said "there will be no cancellations (of flights to and from the Netherlands) as a result of the unnecessary strike action by the Dutch pilot union". In a later statement, Ryanair said that despite the "regrettable and unjustified strike action" more than 2,000 flights - 85% of its schedule - would operate as normal across Europe today. Speaking in Charleroi this morning, a representative for Belgian union ACV-CSC Didier Lebbe claimed Ryanair had no respect for pilots. He said: "Ryanair is the only multinational in Belgium that doesn't respect the Belgian law and that's not normal. "We ask the authorities in Belgium, but also the European authorities, to do their job. If they don't do it, it means that Ryanair has more power than the local authorities in Europe. "Ryanair has no respect at all. They have no respect at all for the pilots and also for the cabin crew." At a Frankfurt press conference on Wednesday, Ryanair's chief marketing officer Kenny Jacobs said the company's German pilots enjoy "excellent working conditions", earning up to €190,000 annually, which he said was more than their peers at budget rival Eurowings made. But chief executive Michael O'Leary has also warned the airline may shift jobs and planes to more profitable areas if the turmoil continues. "I think it also sends a signal to other companies where workers are played off against each other," he told Germany's regional broadcaster RBB.